The nests, also known as mounds, protrude from the ground like skyscrapers and can grow as tall as seven metres. They are also self-cooling, self-ventilating, and self-draining—but until now the mechanisms behind these climate control features has remained unknown. A group of engineers, biologists, chemists and mathematicians lead by Imperial College London, the University of Nottingham, and CNRS-Toulouse have looked closer than ever before at how these nests work using 3-D X-ray imaging. They found small holes, or pores, in the walls of termite mounds which help them stay cool, ventilated, and dry. 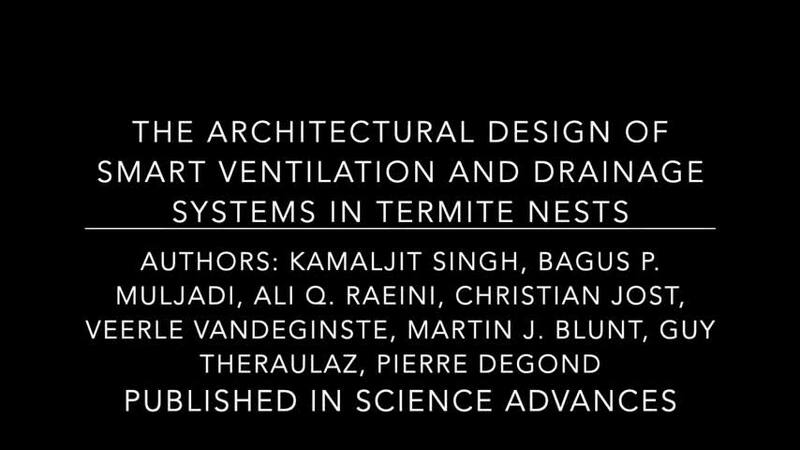 Lead author Dr. Kamaljit Singh, from Imperial's Department of Earth Science & Engineering, said: "Termite nests are a unique example of architectural perfection by insects. The way they're designed offers fascinating self-sustaining temperature and ventilation controlling properties throughout the year without using any mechanical or electronic appliances." In their new study, published in Science Advances, the researchers sourced termite nests from the African countries Senegal and Guinea and studied them using two types of 3-D X-ray imaging. The researchers found that networks of larger and smaller pores in the nest walls help exchange carbon dioxide (CO2) with the outside atmosphere to help ventilation. 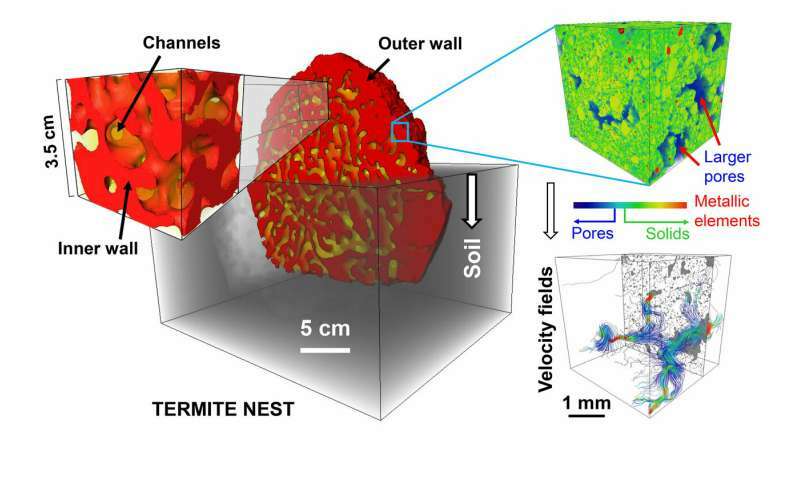 Larger micro-scale pores are found to be fully connected throughout the outer wall providing a path across the walls, and by using 3-D flow simulations, the authors showed how CO2 moves through the nests to the outside. Dr. Singh said: "This is a remarkable feature that lets the nest ventilate regardless of the weather outside." Nests are usually found in hotter regions, which means they must stay cool. Indeed, the authors found that the larger pores also help regulate temperatures inside nests. The pores, which lie in the outer walls of the nest, fill with air which reduces heat entering through the walls—similarly to how the air in double glazed windows helps keep the heat inside. They found that the nests use 'capillary action' - where liquid flows through small spaces without external help from gravity—that forces rain water from the larger pores to the smaller pores. This ensures the larger pores keep stay open to keep ventilating the nest. Dr. Singh said: "Not only do these remarkable structures self-ventilate and regulate their own temperatures—they also have inbuilt drainage systems. Our research provides deeper insight into how they manage this so well." Co-author Professor Pierre Degond from Imperial's Department of Mathematics said "The findings greatly improve our understanding of how architectural design can help control ventilation, heat regulation, and drainage of structures—maybe even in human dwellings. They also provide a new direction for future research, and will eventually bring us one step closer to understanding mechanisms that could be useful in designing energy efficient self-sustaining buildings." Co-author Dr. Bagus Muljadi from the University of Nottingham said: "We know that nature holds the secrets to survival. To unlock them, we need to encourage global, interdisciplinary research. Molecules are orders of magnitude smaller than the pores and ventilation holes discussed here. Ojorf> Molecules are orders of magnitude smaller than the pores and ventilation holes discussed here. Weak wind sends 02 out main pathway holes and pushes C02 out smaller branch pathways. C02 comes out slower but is more diffused. Strong wind blows it all out. In that case, momentum overcomes the sizes of the holes. if i remember correctly, CO2 masses heavier than O2 ? & that is why a cloud of carbon dioxide can be so dangerous in large concentrations. As it shoves the oxygen away? Yes, and I assume the fungal farms the termites grow would suffocate if this C02 concentration wasn't vented out. The pores and the overall enclosed structure of the mound allow for the low internal temps in the hot African sun. Open spaces act as insulation and a place for the gas to drift into when the breeze is low. What relevance, 0.03% CO2 has anything to do with air cooling circulation? Ambient C02 from incoming air isn't the issue. It's from the fungal farms which are fed wood paste by the termites. The fungus eats the wood paste and produces C02 in the process. In an enclosed chamber this would build up over time and suffocate the fungus, therefore making the termites go hungry who harvest and eat the fungus. It is synergetic relationship between fungus and arthropod that has developed over millions of years. How you may ask? Gradual steps of building nests over millennia and finding things to eat. Eventually some how, some way, the termites learned to do agriculture. Because C02 is part of the cycle of life on Earth. Even plants respire and produce C02 on the cellular level. They just don't emit as much as they consume when they photosynthesize during daylight hours. And since the current percentage of oxygen in the atmosphere is largely attributed to photosynthesis (a process that uses photons, water, and CO2), one could say that CO2 has a hand in making the oxygen percentage side of the ventilation gases. I wonder if the researches have considered releasing a "MineCraft" version of this data for educators?